This guide is designed help parents of beginning band students understand the rules, procedures, and expectations of the band program. Please read through this information carefully. You are always welcome to ask questions once you have reviewed all the material. Draining cloth (washcloth or rag that can be stored in the case). Recommended: Selmer CLSOL300 with Vandoren 5RV Lyre mouthpiece and Rovner ligature. Our Band Department uses Meyer Music to help serve our band program. The Meyer Music company works hard to offer products at a fair price and to deliver them to our schools as quickly as possible. When you order, you will need to tell them the school district (Ray-Pec) and the school (Bridle Ridge) and your child's name so we can get the supplies to your child as quickly as possible. I strongly recommend having Meyer Music deliver the items directly to school. If you do this, shipping is free, and it arrives much faster. Ordering your Band Book online: If you are ordering the band book online, go to www.shopmeyermusic.com, find our school, then find the "Method Books" section. 1. Do NOT attempt repairs yourself. Too many times I've seen simple repairs turn into big repairs because someone in the family tries to fix it themselves. Please do not put your child's instrument at risk of further damage. 2. Let your band director look at the instrument. Many times Mr. Jarrett can fix common instrument problems. I have several instrument tools that are not the same as tools you may have at home. If I cannot fix it, I will let you know. 3. Let the pro's fix it. If the repair cannot be completed by Mr. Jarrett, I will recommend the instrument be sent to a repair shop. Many of you already have this covered through your rental agreement with Meyer Music. Your repairs may be completed at NO COST. If you did not select the repair plan or your instrument is not from Meyer Music, we can still send your child's instrument to Meyer Music. Before an instrument is sent in, your child should remove their mouthpiece (and reeds, if clarinet or saxophone) and music continue bringing them to class. This will allow students to continue participating in class while the repair is being performed. Deliver your instrument to the designated location in the band room. Enter the room in line order and quickly get your instrument and music stand. Sit in your assigned seat and put your instrument together. Place instrument cases, Chromebooks, and any other items under your chair. Watch for Mr. Jarrett to step onto the podium. Immediately give your full attention. Return your music stand to the stand racks. Return to your seat and wait quietly to be dismissed. Take your instrument with you to your final classes. Students will have quizzes where they play their instrument for Mr. Jarrett. Students will track their progress in class, and for some assignments they will receive a sticky note (like the own shown) to put in their book. The sticky note shows their score for each learning target (except #5) and areas to improve. Students are expected to practice their instrument at least 80 minutes per week. Example practice times are shown below. As you can see, it is possible to adjust your practice time schedule to work around the other events in your life. It is recommended to spread the 80 minutes over a minimum of 3 days. Practicing allows students to refine and perfect their musical skills. ​Proper practice allows students to keep up with the fast-paced learning that takes place in band. Students will typically be assigned two pages from the band book each week. The pages include various lines which introduce new skills and give students the opportunity to practice the new skill leading to a quiz. Students will have a quiz most weeks, but not all. Practicing is homework for band. It is an important step in the learning process for band students. As parents, you have the opportunity to help your child succeed in band! With your guidance, encouragement, and sometimes maybe a firm reminder of how much that instrument cost, your child will complete their band homework and grow into a skilled musician. For students, the benefit of practicing is to become proficient on their instrument. Honestly, the better they play their instrument, the more fun band is! What if my child doesn’t practice? If your child doesn’t practice, they will fall behind in band. If your child isn’t practicing (in other words, isn’t doing their homework for band), then it is time to have a talk with them. Your child will sometimes rely on your guidance to help them make the best decisions for them. Students occasionally need a new approach. You can remind your child of all the practice strategies introduced in class. ​My child practices, but it doesn’t sound very good. ...yet! It doesn’t sound good yet because your child is still developing the fundamental techniques to make a good sound. It will get much better soon, but only if they keep working on the skills assigned in their homework. Keep encouraging your child. It will only get better if they KEEP PLAYING! Practicing shouldn't always sound great. This is the opportunity for students to explore new notes, rhythms, and skills. The purpose of practicing is to improve upon the new skills introduced in class. I’m ready to help my child be successful! Now what do I do? Help your child create a good practice environment where they can concentrate without distractions. Your child’s bedroom is fine for this as long as other siblings, pets, and any distractions are avoided. Create a scheduled time for your child to practice. You need to set aside time 3-5 nights per week so their total practice time adds up to at least 80 minutes. Setting a schedule helps your child know that practicing is important. If your child wants to play longer than the assignment requires...let them! You will be rewarded for amazing sounds in the future! ​Note: Mr. Jarrett will provide you with a Student ID specific to each band student. You will not be able to enroll into EEi until you have this information. The Student ID will be provided during the first days of school. Enter your student's code (provided by Mr. Jarrett). ​To assist with practicing, students will be able to access recordings of the assigned lines by going to www.myeelibrary.com. The student will log in using the code from their band book. They can download the recordings onto their Chromebook at school and then use the recordings to practice at home without a need for an internet connection. More detailed instructions will be provided to students during the school year. Positive encouragement goes a long way. Be positive and encourage your child to be successful in band. Feel free to laugh with them when their instrument sounds like a sick elephant. Make a point to let your child know when you hear their sound improve. You know your child better than anyone. Be careful not to embarrass them. If your child is reluctant to let you hear them play their instrument, this is a sign of embarrassment. It is very important to work through this situation so that your child is practicing appropriately. I've had many students run into the band room excited because of the positive praise they received from their parents. I've had many students claim they were able to play a quiz really well because their parents made them keep trying because they knew it could be better. Being encouraging and supportive does not mean saying everything is great...even when it isn't. False praise doesn't work. Point out when things sound good. Encourage your child to keep trying when things sound bad. Bad sounds always get better with more practice. Students are required to bring their instrument, mouthpiece, and music/supplies to school on each day. 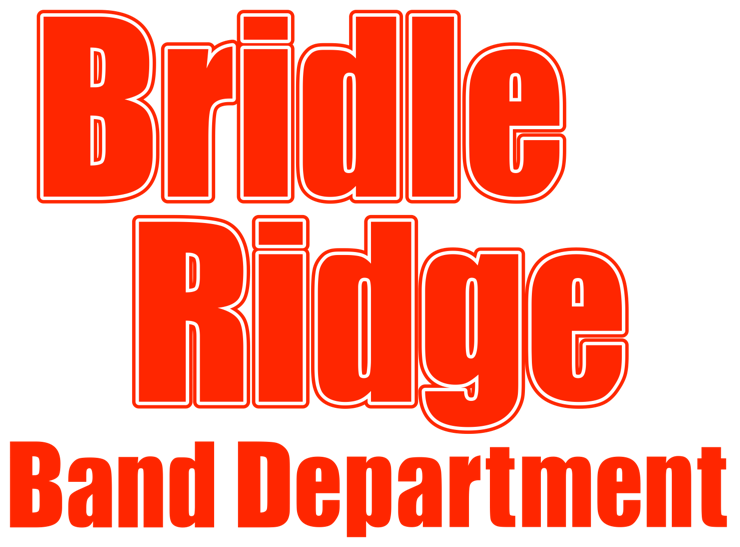 Although many classes at Bridle Ridge meet only every other day, band classes meet every day! Students are only allowed to store their instruments at school during the school day. When they arrive at school, they will drop off their instrument to the band room and continue to their pod. After band class, students will take their instruments with them for their final class and then take them home. Instruments always go home each day and are not allowed to be left at school. Mark you calendar! Beginning Band students have two concerts each year. Concerts are required events. You are welcome to invite friends and family to attend. The first concert usually lasts around 30 minutes. The May concert is the Band Departments showcase called the Band Extravaganza! This concert will feature Bridle Ridge, a middle school band, and a high school band. After performing, students watch the other bands perform. It is an opportunity to see what band is like as they get older. I sometimes get questions like, "will these pants be acceptable?" or "we don't have dress shoes"? I understand you want to do you best. Please use your best judgement and help your child look nice for a very special occasion...their band concert. Now that you have completed the Parent Guide fill out this form to let me know. I hope you found the information helpful and useful. If you need to contact me with additional questions, please email Dillon.Jarrett@raypec.org. I have read and understand the information contained in the Beginning Band Parent Guide.